50,579 photos were downloaded with Bulkr in the last 1 hour! That's more than 573 million photos! 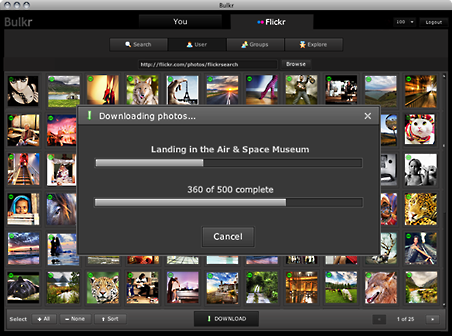 Bulkr is a desktop app to backup, browse and download photos + videos from Flickr. Install it free. Do more with Bulkr PRO! Brilliant, so easy to install and use. The tool every flick user should have. It's the only app I tried for downloading 10,000 full-size photos that didn't crash on me. I've been using this app for about 5 minutes and I wish I'd been using it for 5 years! Brilliant!